This is a full set of 4, front and rear performance drilled & grooved brake discs to fit the vehicles listed below. 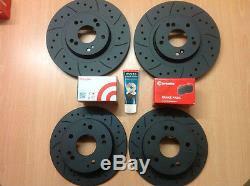 Civic Type R FN2 Front Rear Drilled Grooved MTEC Black Brake Discs & Brembo Pads & Lube. These come with MTEC's unique Black Edition Coating to prevent rusting on the unswept surfaces. Includes Brembo brakes pads front and rear. Also contains a tube of MTEC Brakes CG29 Copper Greease. If your fitment is not listed, check our other items and our shop. We are a UK based company that specialise in the manufacturing and supply of performance brake discs and brake pads. Our discs are machined using state of the art CNC machines which ensure all designs are cut with precision. IV, HS, KA27-28, KW, PA20-49, PA60-78, PH17-26, PH30-44, PH49-50, ZE, TR21-25. The item "Civic Type R FN2 Front Rear Grooved MTEC Black Brake Discs & Brembo Pads & Lube" is in sale since Saturday, November 8, 2014. This item is in the category "Vehicle Parts & Accessories\Car Parts\Brakes & Brake Parts\Brake Discs". The seller is "mtec100" and is located in uk. This item can be shipped worldwide.